The second week in December was another fun packed week. Tuesday was Isabella's Birthday. She had her party with friends on Sunday - on Tuesday we were invited over for dinner. Isa's choice for supper was stuffed shells with a confetti cake. Papa brought the Neapolitan ice cream and his famous bottled soda's. He always brings different bottle sodas to events. The kids love them! Thursday during the day I made my Christmas Cards. This is my first year making all of the Christmas cards. I wanted to make each card meaningful. This is something I will definitely be doing every year. Each card is my gift to them made especially for them. 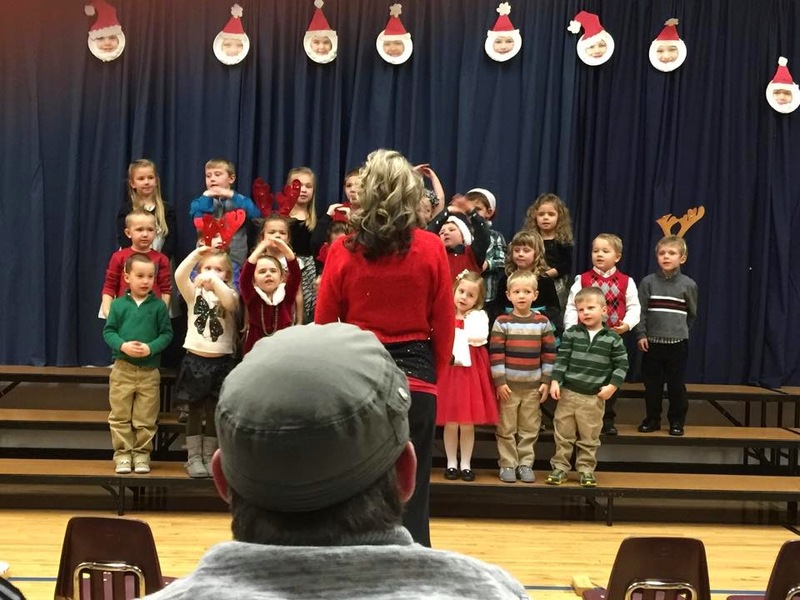 Then Thursday evening was the kids Christmas Concert. Their concert is one of my favorite Christmas events. Check out the pics........the first pic is Davey's class. This is the 4K and kindergarten class. Davey is in kindergarten...he is second row far left. The boy in the red shirt with the Mohawk hair style. The next pic is the Kansasville choir. Isa and Caleb are both in the choir. Caleb is the young gentleman in the back row turned the wrong way. 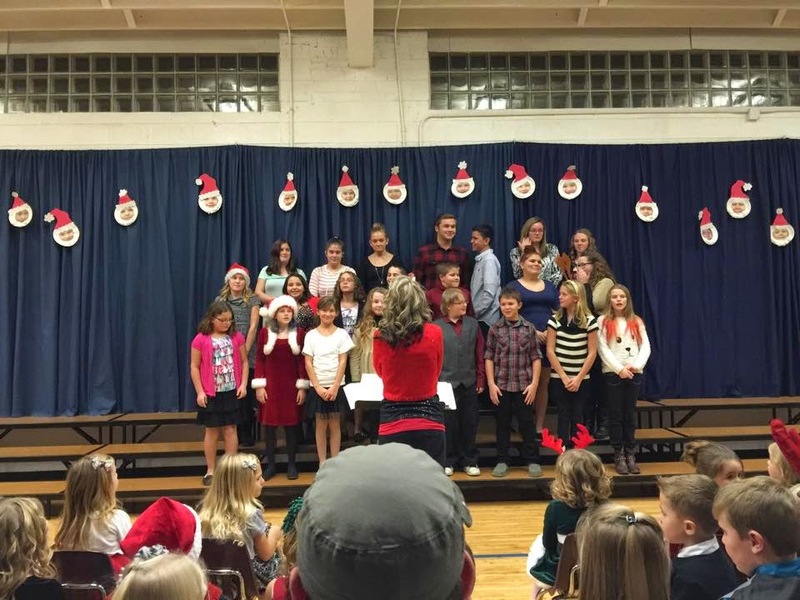 Isa is in the second row second girl from the left in the red sweater with the black/white/red polka dot dress. They all love singing! Kansasville School is a small rural school. There are only 100 children for grades 4K - 8th Grade. This is the last year that all three kids will be going to the small school. Caleb is in 8th grade ~ Isa 5th and Davey is in Kindergarten. This is Caleb's last year of participating in a annual school Christmas Concert - next year I will miss him singing. Friday night is Fish Fry Friday in Wisconsin. We went to our favorite restaurant Home Again for their fish fry. DELICIOUS! Then Isa and I were on our way for some Isa & Nana Fun. We had tickets for the local theater groups production of Scrooge the Musical. Scrooge was excellent - the cast did a great job. The Haylofters are the oldest running theater group in Wisconsin. Before the show we stopped at our favorite coffee shop for a tasty holiday latte. Isa is a coffee lover like her Nana. Isa asked "Nana can we do this every year?" I said "Sure we can!" Saturday was a lazy day - we caught up on household task and relaxed. Isa stayed all night and she spend the afternoon playing on the computer. A quick trip to the market to pick up Papa's special bottled soda - then we headed to Dawn & Dave's. December 13th is Davey's Birthday!!! Dinner party at his house. Each birthday the kids get to pick the dinner menu. Davey picked Sub Sandwiches & French Fries for dinner with Brownies & Spumoni Ice Cream for dessert. Check out this Elf of a 6 year old!! Too cute in his new Christmas PJ's. 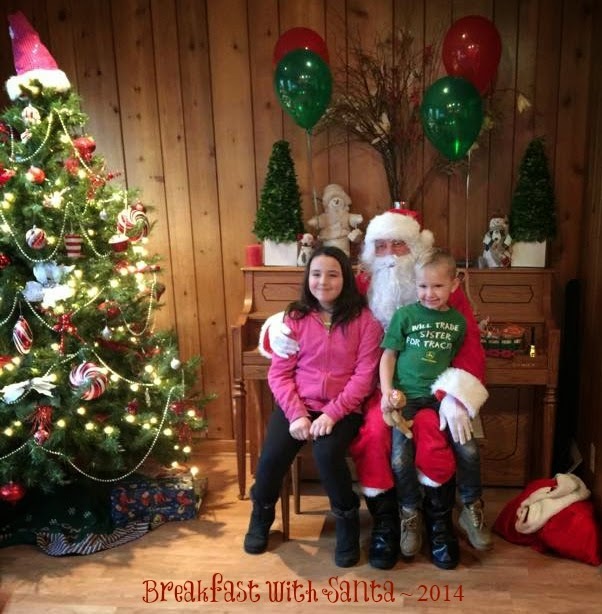 Sunday morning 8:30am it was Breakfast with Santa! Oh My Gosh what a fun time! Thursday when I was making cards I though I would make the kids a card to give to Santa. Davey was so excited to give Santa his special Christmas Card. Home Again also gave them a sugar cookie to decorate after meeting Santa. Oh I almost forgot on Monday Dawn called me to ask me if I wanted to up date my phone. We have AT&T service ~ they have a great promotion. I upgraded to a New Fire Phone and I received a Kindle Fire HD for 99 cents. Phone was free and the Kindle was only 99 cents! Plus, it included a year of Amazon Prime. I love to read - I have a Color Nook and I wanted a new Kindle to take advantage of the many deals on e-books. It is like I got a great Christmas gift early!!! This post is going live on December 18th - Yipes..Christmas is one week from today! Time is moving FAST! One more week of fun before the special day. I was reading about this awhile ago. It is extremely interesting & seems very promising. 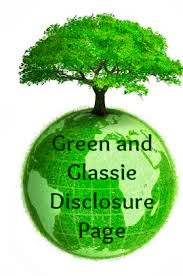 After more research & information becomes available hopefully it can be proven effective. That would be amazing.